No doubt if you are into painting of the artistic kind then you will probably know that artist Thomas Kinkade passed away last Friday, and although an autopsy has been completed, it appears that an announcement as to the cause of Kinkade’s death could be weeks away, as the Santa Clara County coroner is awaiting results of tests before deciding on the cause of death. However, according to the LA Times, the artist’s family attribute the painter’s death to natural causes, but this will be determined by the coroner. 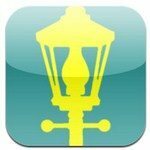 The works of Thomas Kinkade have been produced for the mobile space via several mobile applications, and so we thought we’d bring our readers a few Thomas Kinkade apps today. We have three Kinkade apps for the Android platform and one for the iOS faithful so you can enjoy the works of one of America’s most collected artists on your mobile device. First up we have the Thomas Kinkade Gallery app for iOS devices, that delivers a gallery of the works of Kinkade with each image produced to Kinkade’s exacting standards, and includes such collections as bridges, churches, cottages, gardens, estates, cityscapes and more. 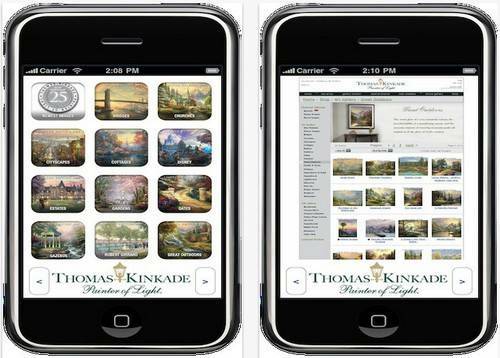 The Thomas Kinkade Gallery app is for the iPhone, iPod Touch and Apple iPad and is iOS 5 compatible and can be downloaded to your chosen iOS device for free by hitting up iTunes. 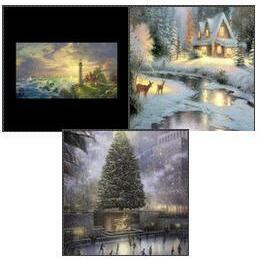 The three Thomas Kinkade apps for Android come in the form of live wallpapers, and are the Thomas Kinkade Lighthouse app that delivers a collection of lighthouse paintings, then there is the Thomas Kinkade Snow globe app, again delivering some of Kinkade’s most famous paintings, and lastly there is the Thomas Kinkade NYC Christmas app that delivers Christmas scenes, and all these Android live wallpaper apps are available from Google Play at a cost of Â£0.64 each.